Does your school host an annual bilingual book fair or sale? If not, now is the time to start! The BookLingual Bilingual Book Sale is like hosting a mini-book fair tailor made for your bilingual and dual language students. 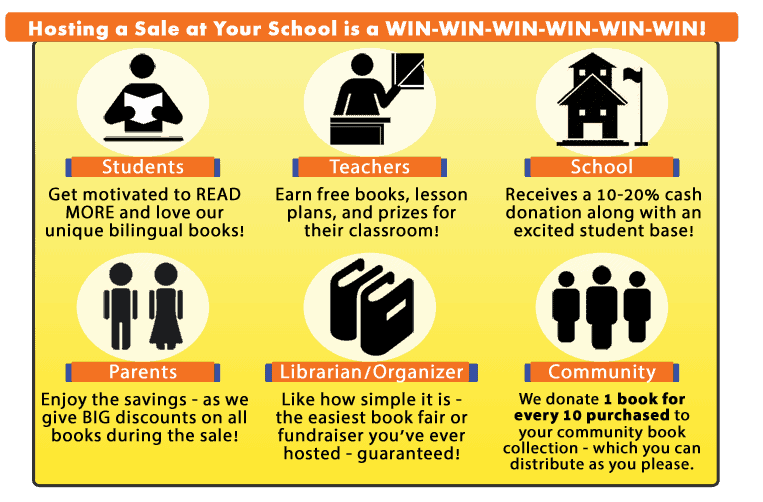 Parents of bilingual, language learning, or dual language students appreciate the opportunity to purchase books – and at the same time – support their school, teachers, and community! Best yet, there is ABSOLUTELY no cost or risk at all for the school. We take care of everything, and everyone wins! Why Host a Book Sale? We donate 1 book for every 10 purchased to a community book fund. These books can be distributed or used as you please. The idea is to have free books available for underprivileged children and the local community, so that everyone gets an opportunity to read. How much does it cost to host or put on this sale at my school? There is no cost at all. We pay for the shipment of books, promotional materials, supplies, return shipment of leftover books, and have everything else taken care of. Is this a fundraiser or a book fair? Truthfully, this bilingual book sale could be looked at as either a fundraiser or a “mini” book fair. The book sale itself is a fundraiser for the school/library to get extra funds. The book sale also allows teachers to get free books, as their students get to purchase great books at a big discount. What grade level is this book sale designed for? Currently, our books and materials are designed for grades PreK – 2nd. So, only your early grades will be involved in this sale. As we grow into the future, we will be adding grades. What states can host a book sale? Any state in the United States of America! If you are interested in organizing your book sale, just reserve your week below. I am not sure if my district will allow us to hold this sale…how does the book keeping work? Does your school do fundraisers, or host a book fair of any sort? If so, we can setup this bilingual book sale for you. Districts do vary on how to “classify” or organize this event. We are completely ready to support any need on your end. We can supply our W9, will become a registered district vendor, and complete other necessary steps to make it easy on everyone. I am too busy this year, how much time will I spend on this? We know you have A LOT going on as a librarian/teacher/faculty member at your school. That is why we have made our sale as simple and organized as possible. Expect to spend a few hours upfront communicating to the teachers about the event, handing the flyers to them/or in their box, some time making sales throughout the week, and finally a little time to pack up the return shipment box. Our goal is to make it a lot of fun and easy – as you have your own personal account executive to help you out. Do I have to host this for one week? Are there other options? Most schools host our stand one week sale. Contact us if you have a special request. In the past we have had schools setup a sale for just one night (such as at the Dual Language Night, PTA meeting, or special event). Or, you may want to have an extended sale, either way, just ask. Give us a call at 254-768-2922 or email us now at [email protected] We are here to help! We will confirm your requested book sale, become a district vendor, and any others steps your school requests. Two-three weeks before the sale, you will receive your shipment of books/flyers/sale materials. Your BookLingual account executive will also give you an easy to follow action list. You will be all set!